Littering. Our volunteers spent days searching for a poor swamp-hen that had a Coke-can stuck to its mandible which meant it couldn't eat. Irresponsible Pet ownership. Our volunteers spent hours nursing baby animals back to health after they became victims of cats wandering about at night. Bad driving. Our volunteers have dragged the limp bodies of dead or dying wallabies off the roads after they were struck by vehicles. Thoughtlessness. Our volunteers have been swamped with injured birds and homeless possums after their trees were cut down without a thought for the destruction of their homes. 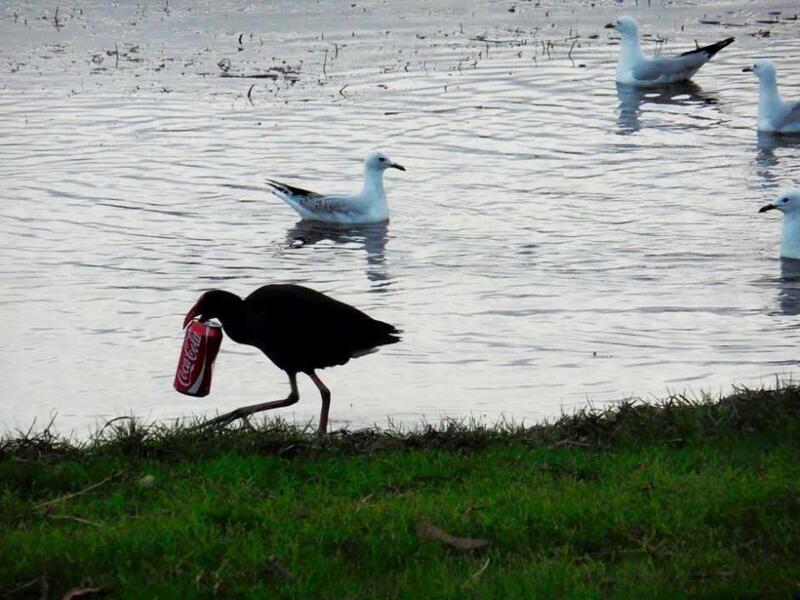 Swamp hen wearing litter... Photo by Andrea Louisa Glazier. If you're fishing, make sure you take all your fishing hooks and line with you. Many of our sea-birds get horribly entangled in fishing line or swallow fish-hooks that have not been properly discarded. Radiography of a sea-gull that has ingested a discarded fish-hook. Be a good owner and do the right thing - for your pet and for our wildlife. You may not like to think of your fur-baby as a killer, but they certainly do a lot of damage to our nocturnal wildlife. A cat's saliva is a lot like venom to many of our little native animals and without treatment, they will die within hours of being in kitty's mouth. Similarly, there are dangers after dark for your cat. Every day I see at least one that has been a victim to car-strike. There are also pythons, powerful owls and foxes out there that pose a threat to a wondering kitty-cat. If you love them, keep them indoors - particularly at night. Baby ringtail, baby swamp snake and baby bandicoot - all victims of cat-attack. Driving at night means that you are more likely to encounter our nocturnal wildlife. Between dusk and dawn, slow down and stay alert. If there is no oncoming traffic, use your brights to keep an eye on the road ahead. If you do happen to hit an animal, contact your local Wildlife Rescue Organisation immediately. If you hit a marsupial, stop to check its pouch for joeys - they can still survive even if the mother is killed. Wildlife Roadkill statistics show that 727 wallabies were killed on the Wakehurst Parkway since 2010! That's just on one road!!! Our wallaby populations can't sustain that kind of loss year on year. Mama wallaby and her joey hit on the Wakehurst Parkway. Everyone wants good views and minimal leaf-litter in their yards these days. This seems to equate to tearing down every tree in sight. What people need to remember is that trees are more than just trees - they are homes to many little creatures such as birds, sugar-gliders, micro-bats and possums. When their home is torn down they need to find alternate accommodation which puts them in danger. They have to cross roads into other animals' territories and sometimes they will try to make a new home in your roof! Trees are beautiful in their own right. Enjoy them as part of the view and respect the homes of all critters. Possum mum and twin babies lost their home when their tree was torn down for better views. If you follow these simple rules, you will be saving our wildlife for Christmas this year and for many more Christmasses in the future. Be responsible, be safe and be a good human. Merry Christmas and have a wonderful and wild 2016!! !